Home » Toynami » Zentradi Vinyl Battlepod from Toynami! Zentradi Vinyl Battlepod from Toynami! It's finally here! The 1/100 Zentradi Battlepod! 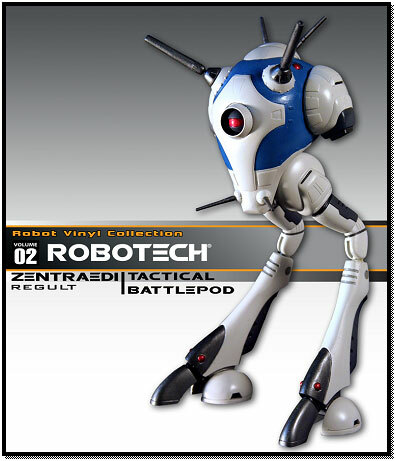 The Robotech Zentraedi Tactical Battlepod is Volume 2 of the Robot Vinyl Collection! This 1/100 scale model was designed to fit in perfect scale with the 1/100 scale Transformable Veritech Action Figures. This Battlepod Vinyl is strictly limited to only 2,000 pieces worldwide! 25 dollars for a run of only 2000? Seems like a good deal, if it's your thing. Totally cool. Where can we order them? So, how big will this be? Did we decide the Regults were really big in the end? Because if they are, it'll be a massive figure, right? Seems good value for $25. Ben, I'm going to buy a bunch and have you paint them up in dark DYRL colors! Wow, I'll def be buying that! There's not any pre-orders up anywhere yet (that anyone's aware of) are there? They will probably be up soon at the usual suspects for Toynami stuff - Robotech.com, Entertainment Earth, BigBadToyStore etc.. YES. I will probably buy four of these... fantastic. These are the Macross toy people have been waiting for. I suspect there's going to be some ABS or PVC involved, looking at the leg joints. Hope its got a snazzy box, too. Toynami's done a really nice job making packaging evocative of 80s Takatoku packages. Their vinyl Voltron box reminded me of the celuloid cubes Takatoku's Macross vinyl pieces were sold in. It will be approximately the same size as the Revoltech release. Come on Toynami give us a 1/72 version, too. Actually, its alot larger than the Revoltech version. Keep in mind that a Zentaedi soldier can sit inside of one of these and pilot it, and that a Zentraedi soldier is roughly the same height as a Battroid/Battloid. So basically, picture a 1/100 valkyrie in Battroid mode fitting inside of the Battlepod. I received my Regults (standard and heavy artillery versions)from the U.S.A. yesterday and you're right, Dan. They are quite big and very impressive! Can't wait for the light artillery version and the Glaug! Dan - Have you seen it first-hand? I'm not questioning your accuracy, and I'd be even happier to know it'll be bigger than the Revoltech. We know what you're describing is the approximate scale layout it *should* have, but I'm just curious if you were able to look at the product's size relative to the 1/100 Toynami Valkyries first-hand at SDCC or where ever. I preordered 3 from BBTS... maybe I'll grab another one to paint DYRL down the line. I cannot believe there is no thread on MW for this yet... we finally get a new enemy mecha toy in one of the good scales, and not a peep. Maybe without anything negative to say, they didn't think it was worth a thread?
" I cannot believe there is no thread on MW for this yet... we finally get a new enemy mecha toy in one of the good scales, and not a peep. Maybe without anything negative to say, they didn't think it was worth a thread?" Maybe they're disappointed that it's a Robotech toy from Toynami and not a Macross toy from Yamato. I understand the majority members @ MW.com are uh....do I dare say it?....die-hard Macross fans with a touch of elitist agression down their nerves...Sorry everyone, I mean...it's the truth. Just ask Veef. Or maybe they're too busy arguing the hell out of Astro Plan, a Chinese Macross F/Gundam 00 knockoff show. Maybe they're being silent about it & buying time for Yamato, Bandai, Kaiyodo(I'll believe it when I see it) to develop a Battle Pod with a cockpit that opens to put a Zentraedi in to play with. I can't say for them since I'm being assumptive, but I can say for MYSELF that I'm one of those disappointed that there's no open hatch, no cockpit, & no giant enemy pilot to put in the Regult to fly it around the room & pose with it. That's the only negative thing that I can say about it. The ONLY positive thing that I can say about this is that it's finally out there & everyone here's loving it. This could be sign for good things to come. I preordered just one, but I'm totally jazzed by this thing! Can't wait! Whoo-hoo! excited, especially given the price and the lack of proper battle pod toys out there. I simply can't miss out on this one!!! Toynami Vinyl Regult has Shipped!!!!! For those of you that are interested in the Toynami Vinyl Regult, mine has just been shipped to me from Robotech.com, I should get it next week. With only 2000 made world wide and the amazing price of $25.00 each ($35.00 w Shipping) I'm sure they are going to sell out quickly. Pick one up or have no regrets! Picked this up the other day, for the price it's a pretty awesome piece, nice to have a in scale battlepod. Would highly recommend him if your looking for a more Destroids to fill out your Macross shelve.